I love a surprise. I love books. I love board games. 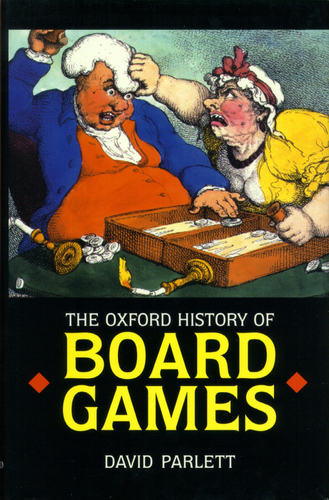 So you can only imagine my delight on finding The Oxford History of Board Games, by David Parlett, on my living room coffee table last evening. One of my dedicated readers thought I would enjoy it. It was a fantastic surprise. The book has been out of print for a decade. A lot has changed on the contemporary board gaming scene but the roots and mechanics of many past games makes for interesting reading. Board games go back thousands of years. You will find them in nearly every civilization. Games of skill, chance, dice , war, right up to today’s Euro game revolution. The evolution of board games and the influence that these ancient games have on today’s play make this book a great addition to my gaming shelf.